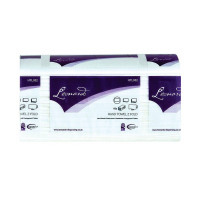 These highly absorbent 2-ply white paper hand towels provide an economical, simple and hygenic method of hand drying. These towels are interleaved, so when fitted to any standard hand towel dispenser, only one towel is presented at a time, avoiding excess waste. This bulk pack of 2,250 provides towels that are durable and long lasting. These hand towels are 100% recycled and provide great value for money.